Since the proclamation of the social security reform by President Daniel Ortega on April 18, violent protests are taking place in the Republic of Nicaragua. Demonstrations arrived at a different stage with the intervention of armed provocateurs among the protestors, leading to dozens of death since then. Last year, the US had prepared the economic grounds for destabilization in Nicaragua by passing the law called NICA Act, meant to prevent any international financial support to the country. The infamous counter-revolutionary institution National Endowment for Democracy (NED) has also intervened in the process by lending thousands of US dollars to certain Nicaraguan NGO's. The Communist Party of Chile (PCCh) asserts that the reforms proclaimed by Ortega were used as a pretext to launch "a plan directed from abroad with the objective of destabilizing the nation and provoking the overthrow of the Sandinista Government." 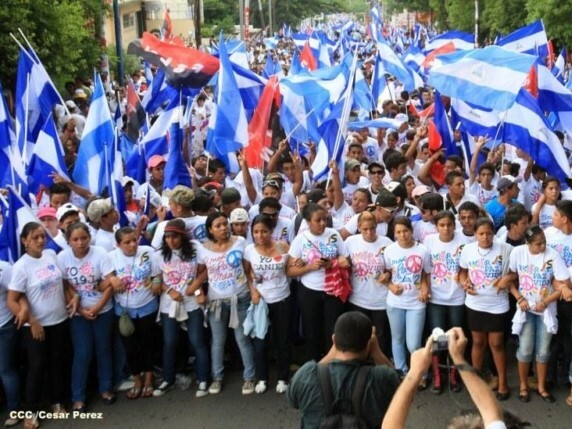 The PCCh rejects the attempts of destabilization in Nicaragua, which are intended to escalate a conflict of uncertain and tragic consequences for its people, including the ongoing fratricidal violence. The PCCh expresses its repudiation of any attempt to interfere in the internal affairs of the Republic of Nicaragua and the disinformation campaign in social networks and media and strongly supports the efforts of the Sandinista Government to promote a broad national dialogue with the participation of the Church, employers, unions and students, as well as the creation of a Truth, Justice and Peace Commission approved by the National Assembly. Finally, the PCCh urges the Foreign Ministry of Chile to express its support for these initiatives deployed in their sister country, which aim to contribute to a civilized overcoming of this situation, to preserve peaceful and democratic coexistence and fundamental requirements for the well-being of the Nicaraguan people. See the link for the PCCh's statement published on May 9 in Spanish. The Communist Party of Equador (PCE) payed a visit to the Nicaraguan Ambassador in Equador, Leticia Talavera, for expressing their feelings of solidarity against the strategies of the North American imperialism targeting progressist governments of the Continent. Underlining the historical bonds between the peoples of the two countries, the PCE expressed their support for the "heroic struggle" of the Sandinista Government in their way for leading the country towards socialism.